Parents/guardians of students in grade 1-6 will notice a few changes on Term 1 report cards when issued later this month. Report cards will continue to summarize how well students are progressing both academically and socially, only now we are using developmental reporting codes. Being implemented across the province, the developmental reporting codes better reflect the developmental nature of learning for our youngest students in elementary grade levels. 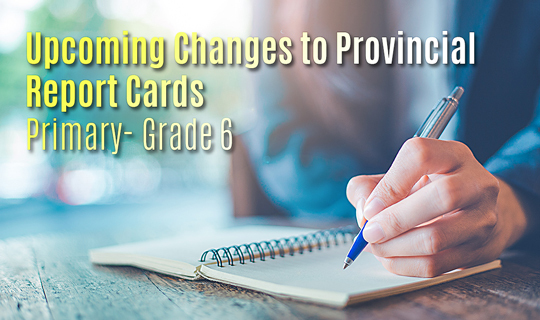 There are no changes to Primary report cards. Grades 1-3 will use the developmental scale for reporting in every reporting term. Student achievement in Physical Education and Music will not be reported formally in Term 1, only in reported in Terms 2 and 3. Like at grades Primary to 3, student achievement will be reported in Integrated Language Arts and Integrated Mathematics. Student achievement in Physical Education, Music and Core French will not be reported formally in Term 1, only in reported in Terms 2 and 3.